While my heart goes out to the family of Trayvon Martin, and I mourn the loss of such a young, promising life, this issue has moved beyond these sentiments. This is NOT about a white man killing a black youth for no reason. This is about a white man killing a black youth for no reason and getting away with it due to an unjust law and corruption. From the City Council to the Police Department, officials are stepping aside. Those who remain are practicing deceit and conspiracy to either suppress or conceal the facts. Some are outright lying. Why was Zimmerman not processed as normal suspects would have been? Where is the evidence that supports their claims that Zimmerman was injured in the “fight of his life”? All the evidence we’ve seen shows NO injury to Zimmerman. Two separate voice experts have established “with reasonable scientific data” that the voice on the 911 calls was that of Trayvon Martin. The State Attorney Norm Wolffinger decided not to charge George Zimmerman. Are you kidding me? This case is under National scrutiny with many discrepancies and unanswered questions and he sees no reason to even investigate? If you ask me, this smacks of concealment…they are hiding something and protecting someone. I think Zimmerman was not the only self-appointed vigilante guilty of intimidation and violent acts against minorities and they have “circled the wagons”. Clannish behavior, if you catch my drift. The Martin family attorney demanded an investigation from the Department of Justice that was evidently taken seriously in spite of what the State Attorney determined. The FBI will be investigating in Sanford, Florida. Zimmerman was taken into custody and arrived at the Police Station in hand cuffs. Clearly someone thought he was a suspect. But somewhere along the line, somebody decided NOT to book Zimmerman and let him go. Wonder what the arresting officer felt about that? The lead investigator told the mother of a witness that he thought it was a clear case of stereotyping, not self defense . She revealed this on National TV during an interview with Al Sharpton of Politic Nation. For those who decry the violence of black on white in other areas of the country, I say this: This is not about black on white or white on black crime. Atrocities happen throughout the United States daily. In every cultural combination: white on white, black on black, Asian on Hispanic, White on Asian…rich on poor, poor on poorer, Christian on Muslim, you name it. 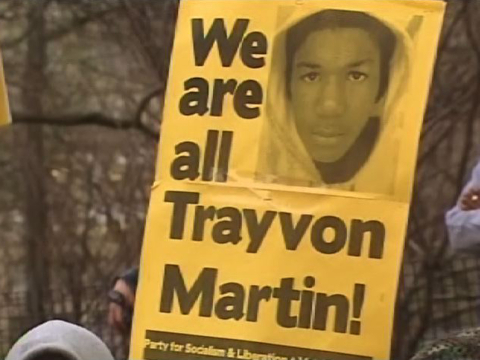 So don’t think this is what Trayvon Martin is about, because it is NOT. This is about Justice and a very bad law that facilitates murder. The common dominator in most of these senseless murders is guns. The Stand Your Ground law is dangerous and vague…leaving too many avenues for interpretation. Jeb Bush, former Governor of Florida who endorsed the law has said it needs to be reviewed and amended. Several state legislators have voiced a similar opinion. Bill O’Reilly charges Al Sharpton with inciting violence. Al Sharpton marched with Dr. Martin Luther King, Jr. and believes in protest, but PEACEFUL protest. Rush Limbaugh claims it is all about re-electing President Obama…how he makes this connection who knows. But know this: The people are not calling for conviction; they’re calling for an arrest and due process of law. One thing is for sure: Something stinks in Sanford, Florida. Today, 7 people were killed and 3 wounded by a gunman at Oikos University, a Christian school in Oakland, California. The website for the school describes its students as “given the opportunity to obtain a Christian education that is based on solid Christian doctrine and ideology. Our main goal is to foster spiritual Christian leaders who abide by God’s intentions and to expand God’s nation through them.” (Mohney, 2012). The shooter was Asian. Will the right wing still feel the same way about gun control after this tragedy that involves the deaths of their “young and promising”?